and a couple of yards of braid!" Is this a Boys Brigade group? I can read one of the badges - "The Church Lads Brigade". There's some info on the various badges here which may help with dating. Not an exact match, but from this wikipedia page on the Brigade (which still exists): Sergeant (three chevrons and a green sash with a button emblazoned with the C.L.B. crest) could be the left middle back row, and: Warrant officer, first class (two crowns, one on each arm, and a drill cane) right middle back row (although here he is wearing two pips on his cap). As the name suggests the Church lad's Brigade (and the Church Girl's Brigade) are associated with the Church of England (and presumably Ireland). So this is probably a CoI church or hall behind, in Waterford. 'Fight the good fight' is written around the cap badges. It doesn't look like Waterford city. Tramore or Dunmore east would be the two off the top of my head that might match. Or St Patrick's Cathedral. commissioned by Mr. R. Grubb, Stephens Green Club, Dublin, but that could have just been his address and not the location. The club is a private members club for 'Gentlemen'. Not many R Grubbs in Ireland per the 1911 Census www.census.nationalarchives.ie/search/results.jsp?census_... Note that the Dublin Grubbs tend to be CoI, whilst the Waterford Grubbs tend to be Quakers (Society of Friends.) I don't think the Quakers approved of the quasi-military nature of the Boys' Brigade, so I'd imagine a Dublin Grubb connection is more likely. [https://www.flickr.com/photos/bernardhealy] The Church Lads was a fair bit more militaristic than BB. The quakers would have had nothing to do with them. [https://www.flickr.com/photos/[email protected]] I hadn't realised the distinction between the Church Lads & the Boys' Brigade. This is an interesting history: connor.anglican.org/2018/09/07/church-lads-and-church-gir... Of note - "In 1893, two companies were established in Dublin, at Christ Church, Leeson Park, and St Peter’s. Another two, at St Mary’s, Donnybrook and St Stephen’s, were added in 1894." "The Great War had dreadful consequences for the Brigade. Companies were closed as they lost their officers and members to the war effort. When the war ended, other than St Mary’s, Limerick Cathedral Company, and St Nicholas’, Cork, CLB and CGB, the main strength of the Brigade was to be found in the north, in the 1st Down, Connor and Dromore Battalion." One could infer from the article that the most likely date for this pic is in the first two decades of the 20th century. [https://www.flickr.com/photos/[email protected]] That stonework looks like a match to me: Christ Church it is! For R Grubbs in Dublin, there is the tame Richard or the more exciting Romney Robinson, an Astronomical Instrument Maker like his father. I was having a look at some newspaper articles, and there was a Lt. Grubb, later Captain associated with Christ Church, Leeson Park and later the Cathedrals in the period around 1898-1902. However, he seemed to be either T. or F. Grubb, not R. Whereas the only T.(homas) in Dublin in 1901 doesn't have an R. associated with him. [https://www.flickr.com/photos/scorbet] Him being a Roman Catholic labourer rules him out. 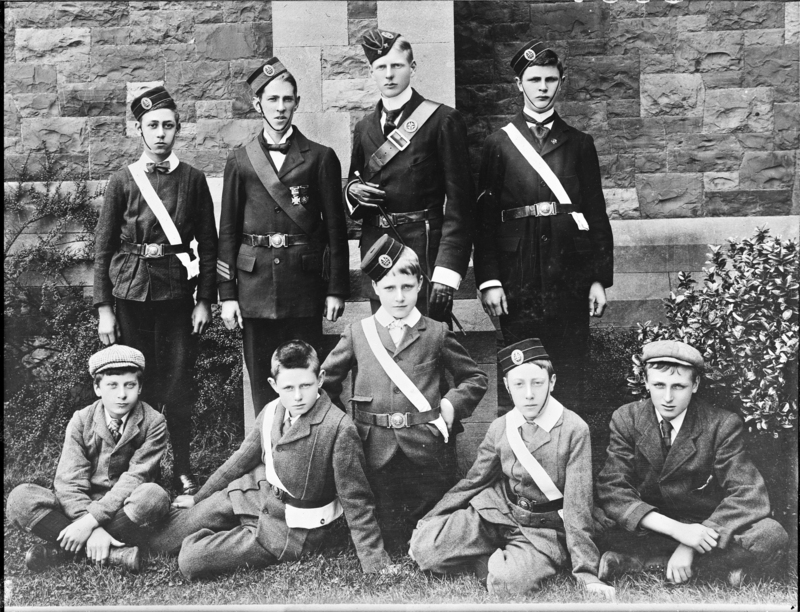 [https://www.flickr.com/photos/bernardhealy] Another thing making me think this is early in the date range is that the boy at our right back is wearing a VR lapel badge. Some Victorian stuff survives (like the Victoria Cross), but my googling does not turn up any specifically CLB use of such a badge. I recognise the badges as Church Lads Brigade. I can confirm that this is a picture of Church Lads' Brigade members attached to Christ Church, Leeson Park, Dublin. This Company, Number 121, was the Pioneer Company in Ireland, formed in February 1893. Another Company was formed in St Peter's later that same year. In all, there were 13 CLB companies formed in the Dublin Diocese...St Stephen's, Donnybrook, Grangegorman, Santry and Glasnevin, others. They had all closed by the summer of 1909...I believe the last to close was St Mary's, Donnybrook. If I knew how to add pictures I would add an image of the CLB badge shown on the caps and also an earlier image of the Christ Church signalling squad showing the same Officer with one rank star on his cap. I would date this picture to the late 1890s. With this Company opening in Ireland in 1893, the Brigade, which is still going in Northern Ireland and in Drogheda, celebrated its 125th Anniversary in 2018 with an Anniversary Service in St Patrick's Cathedral, Armagh. [https://www.flickr.com/photos/[email protected]/32186691788] Is it this one [https://www.flickr.com/photos/[email protected]] ? [https://www.flickr.com/photos/[email protected]] Excellent. Allowed HTML - Flickr this link will help you with commenting and posting.